Remote Control Keychain, which can be easy to work in a few seconds, is compatible with 500 brands of TV. But please notice that it is only work well with Analog TV but not digital TV. 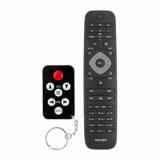 TV Set Remote Control Keychain is compatible with 500 brands of TV and it is so small that you can easily fit it in your pocket, purse, or wallet. It also has a strong keychain clip if you would like to attach it to your keys. It is easy to setup for TV: Press and hold the MUTE button until mute the volume on the TV, then release the button immediately, then the setup is done and you can utilize it. TV Set Remote Control Keychain is perfect for bars, restaurants, the gym, schools, and hotels anywhere. 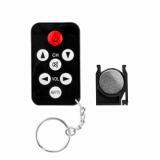 • Minikeychain universal remote control compatible with 500 brands of TV. • Remote controls is available for Analog TV, not OK for digital TV. The keychain clip design is practical and the remote control has its positioning place to prevent missing. Small and cute remote control. My kids often treat it as a toy. God, I need to hide it every time. The remote control keychain is really small but works perfectly. Handy to tote around in bars and such. Now I use it everyday. Sneaky prank! Fun! Works like a charm. Really well worth the price! Easy to setup with Analog TV. Works as described and it does the job well. It's very handy to carry around. It's an awesome Keychain product. Has a good size too that could be kept in our pockets without getting damaged. Excellent range and compatibility with 500 brands of TV.